The Loop Collective is a group of independent media artists formed in 1996 to explore the roots of experimental film and video in dialogue with other artistic media forms. In celebration of our 20th anniversary and the launch of a new publication on the collective's history and DVD, Loop has embarked on a cross-Canada tour featuring a programme of recent works by our members. Erika Loic, Illuminated Text (2012), 14 minutes, 16mm. Stephen Broomer, Wild Currents (2015), 6.5 minutes, 16mm. Izabella Pruska-Oldenhof, Font Màgica (2015), 5 minutes, 16mm. Kelly Egan, ransom notes (2011), 5 minutes, 35mm (digital projection). Ilana Gutman, The Changing Light (2003), 1.5 minutes, DV. Ajla Odobasic, Morning (2011), 4 minutes, Super 8 on DV. Angela Joosse, Of Light From the Ground (2014), 3 minutes, 16mm on DV. Shana Macdonald, dissolution/resolution: forays (2016), 2.5 minutes, HD. Ty Tekatch, A Dream (2014), 1.5 minutes, HD. Dan Browne, Alberta (2014), 3 minutes, HD. Colin Clark, The Trail Ridge is Closed (2014), 11 minutes, HD. Jocelyn Statia, Untitled (2015), 3.5 minutes, HD. Books and DVDs will be available for sale at a special discount! Festival of Light (2007), 3 minutes, 16mm. On Sundays (2007), 20 minutes, 16mm. Hand-processing (2010), 3 minutes, 16mm. Quanta (2008), 9 minutes, 16mm. Routes (2011), 1 minute, 16mm. The Lost Cycle (2016), 25 minutes, 16mm. 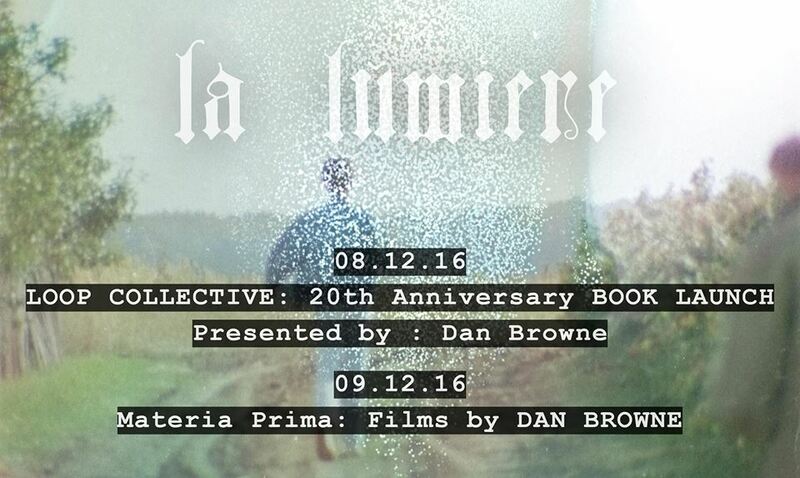 la lumière collective facilitates the exhibitionand production of alternative cinematographic and performance works in Montreal. The artist and exhibition space la lumière (located in the Mile-Ex neighbourhood at 7080, rue Alexandra) also provides the community with a shared workspace and studio rentals. The space was born from a community desire to engage with artists and their works in an intimate environment. At la lumière the artist is always present. la lumière collective operates on a volunteer basis. Contributions go directly to the artists and the maintenance of the space. For more information on the space, please contact us at [email protected].